Show is a five-star 88 beauty. This trip features a short and really sweet first set that's followed by an excellent second set. Big Brent night, shining on Hey Pocky Way, I Will Take You Home, Dear Mr. Fantasy->Hey Jude Finale. This Oxford Take You Home showcases a rare lead-in to drums/space, as it was more commonly played on the other end. Only one of four times played like this (other times were 6/22/88- the song debut, 7/31/88, and 2/11/89). The Rhythm Devils waste no time getting it going. Yes, please! Otherwise, dig the double dose of Bobby early on in the second set with the Looks Like Rain followed by Estimated. Garcia's second set Touch opener is spirited, as is the Eyes. Choice NFA encore is featured on the 30 trips definitive live story. Mmm-bop mmm-bop bop bop. Great show all around, especially the short & sweet 1st set. Queen Jane certainly has some extremely beautiful moments. Brent was obviously feeling good this night too. And Jerry seemed excited to sing Dear Mr. Fantasy for once. Sounded great and energetic! @10:16 mark most of the crowd sees the guy flying around and the band cuts it short. 6 song first set. Both of these show were great (being there) the vibe at the shows were great and the town was too. I also remember the hang glider during bird song. I also recall ole Jer looked up at him, smiled, and even motioned with his guitar toward the guy. Bet the hangglider remembers it well too. These were great times in the summer of 1988, I got to see 4 Venues; Rochester, Saratoga, Oxford and MSG at the end. I remember driving in a friends Ford Bronco, following other fellow heads to these two shows in the beautiful Maine outdoors. What stands out in my mind about these shows was the scene. Does any-one else remember the beer vendors..." kind beers for $1" everything was kind this & kind that..cigarette vendors" icy cold kind cigarettes" The outdoor shows with general admission always got crazy. Myself and pal would take bets on where the rush mob(gate crashers) would break through. At Oxford, I believe it was a tall fenced up gate. One sacrificial lamb fell over first and got nabbed. Next the flood mob pushed the fence down and the streams flooded through. We watched it happen at all the outdoor shows. In Rochester we watched a guy fall/jump from the bleachers to floor/Gen Admission...crazy stuff. AIko AIko, a personal favorite opened up the first set and West L.A. Fade-away at the time a new tune sounded crisp live. One of the hottest shows of '88. I know a lot of people prefer the previous night; as good as that show is (5-star, IMHO), it really does feel almost like a warm-up to this one. Maybe it's the hum-ho quality of the sbd available for that one vs. the beautifully presented recording we have here, I dunno. To each his own. * Tennessee Jed - now tell me that ain't confident! * Mickey and Billy taking the percussion apart on Bird Song - listen to how long they maintain that! * Touch of Grey. Emotional, perfect. * **BRENT**. Over the two days at Oxford, he played four of his best songs and is a *very* conspicuous presence in the 2nd set here. When he's dialed in, it really works. I tend to really pound the majority of Brent's songs as being ridiculously out of tone with the rest of the Dead's canon, but the tunes he delivers tonight, and over the 2 days, are fantastic. 'I Will Take You Home' as a lead-IN to Drums > Space?!? Bring it, Brent! * The ending of the 2nd set is one of the weirdest things you'll ever hear the Dead do. Bobby and Brent are clearly having a LOT of fun; '88 shows in general took apart so deliberately the precision of the "comeback year" - they really do let it ALL GO. The NFA encore continues it - giggles, giggles, giggles! There is a cinematic aspect to this show that has each tune transitioning to the next so *perfectly* it feels like a studio recording. I'll happily enjoy both the entire Oxford shows once in a while, but for me this one in particular is dusted with magic. I remember these shows well..Drove to Maine from Rochester in my 75 Caprice Classic and probably put 15 Qts of oil in my engine for the trip..We arrived and parked right across from the entrance..What a beautiful place located deep in the pines of Maine..Great low keyed scene and all seemed to be right with the world..I had met up with friends who had stopped in Portland and loaded the back of their pick-up truck with beer and booze..then covered the entire back of the truck with ice..oh what a party!!! How could things go wrong with Little Feat opening up?? Well played show from start to finish..One thing that sticks out from this night is that during Bird Song a guy was flying over the crowd in a ultra-light..it was perfect!! Sound quality is pretty good on this,with nice song selection so please..GIVE IT A WHIRL!!!!!!!!!!!!!!!!!!!!!!! I started listening to this show on a grey winter's day and damn if I didn't start grinning ear to ear. This just feels like summer sunshine and heat made audible or maybe just a little bit of the divine in the woods. Outstanding Bird Song and LLR. All I can say is that I wish I was there right now. I remember driving backwards through all these small towns to avoid a crazy line of cars, the fireworks that exploded that happened during Hey Jude. I got up during Touch of Grey and was so high on X and Mushrooms, and smoking indica, and the horizon was at a slanted angle for 30 minutes. This was a great tour and a good time to be eighteen. Overall: second night of the best East Coast shows in summer 88. This is a really solid show. Great scene, great energy, great song choices, great playing. The problem with everyone deciding that certain shows were the best of a particular tour is that they gather some sort of mythic reputation, when in fact, there isn't necessarily THAT much difference between these shows and the rest of the tour. Which is just to say that summer 88 had a lot of really solid shows. These two just happen to rise a little higher. This recording is great, as well, although I'd love a SBD/AUD mix like the night before. The scene: We avoided the huge parking lot and found a small camp-like spot in the woods with about 10 other vehicles. I can still remember the smell of being in the woods during this beautiful summer day. This show wrapped up the mid-west/east coast summer shows, which were fantastic. And what a way to end it - these shows have them going out on top. This was my first full tour and I thoroughly enjoyed every minute of it. Next I was off to the west coast for my first Greek Theater shows. The music: Set I: ok, rare is the day when I get excited over a Hell>Sugaree opener. But I actually think these both sound as good as it gets. Brent lights up Walking Blues with some fine work on the Hammond. Jed doesn't rise to the level it's cabable of. Queen Jane is actually really nice. Usually it doesn't get my attention, but this is a nice version. Bird Song goes waaaay out there. Like most people, I was expecting one more song, but Bobby gives us the "we'll be right back." Inbetween sets I remember an absolute monster drum circle at the back of the speedway. Set II: Touch is well done - Phil's bass bounces around nicely. Hey Pocky Way is sweet. LLR is very good, but not over the top. Estimated is really nice, with even Brent taking turns at the helm. The vocal improv section is weak, however. No ceativity, just single-pitch screaming. The jam after is fluid and nice, but not spectacular. Eyes is really strong. Brent once again has a fantastic piano solo during Eyes. He really brought his game to Maine. Phil also steps up for the jam. Everyone is pitching in and listening to each other - making for some really strong interplay. I don't think Take You Home is best suited in the pre-drums slot, but I love the song nonetheless. Coming out of space, things are a bit asleep. About halfway through GDTRFB, things pick up and everyone starts pitching in to bring this up. Absolutely fantastic Fantasy with Jerry, Brent, and Bobby all pitching in strongly (you can even hear a couple of great licks from Phil). Hey Jude follows because the energy really couldn't have gone anywhere else. Bobby and Brent trade incoherent joyous screams that may be technically deficient, but the energy is amazingly high. Then it goes into a truly one-of-a-kind scream fest with James Brown-like musical stop-starts. Not Fade has much more energy than normal, but we were expecting something else after - maybe another Blackbird (1st one was at Alpine) or a slow and soothing Jerry tune. In any event, it was a great show. Somewhere I heard that Bob Dylan gave Bob his pink guitar? Thing was always on the fritz. He eventually disabled it by repeated smashing. Subject: Almost 20 years ago? These shows were way out there in the forests of Maine. The trip from Rochester to there was like an old style pilgrimage through the forests of yesteryear that just went on and on. Saw the whole summer tour and for a change these last shows were the strongest of tour. Gotta respect something that builds up albeit very slowly too this. Both very nice shows with hint's of old style relaxed playing but in a huge place for a giant crowd of grate people. Gonna give this a 4 only because the sound quality is a little lacking on this for some reason and that we can't give half stars. Does anyone outside of Maine know how far off the beatin track this show is? Subject: Caution--Sandbagger @ Work--use YOUR ears!! Quit doggin' all these 88 shows w/ your low-ball ratings, J-Boy. I have listened to so many great shows this last week and you (of course) have (OVER)-reviewed each and every one as usual. You keep on giving 3 stars to every single one I came across for this 1988 run--while most every reviewer is 4 and more often than not, 5 star rating the same shows. Even the tone of your endless reviews is always a balloon popper @ best! Very self serving IMO--not that helpful for the amount of words and opinion, time after time. There is helpful and then there is downright over-bearing. I know you are trying to be helpful, I am sure, BUT--if the shows or songs are always so mediocre in your minds eye, just have a listen and go on down the road to the next show, minus a review, if you will. Your reviews bring an honestly negative note to what seems to me a lot of peoples good time strolling down memory lane on these review pages. Consider this as you endlessly hatchet so many lil' microscopic details of every show and song you choose to review. A lil' self awareness goes along way.....As for these Oxford shows--sounds like it was as much fun as the music revealed to my senses over the years I have enjoyed these bootlegs. My old aud-Maxell copies had Phil so heavy in the mix-I lost more than a couple car speakers due to these shows over the years. Nice to hear things so crisp after so many years of enjoying these shows. Touch> Pocky WAY, is a real go-getter for a second set start!!!!!!!! had tickets for this one but didn't make the gigs. too bad---the band sounds real muscular during this period. so hip how in the mid-80's or so they discovered that birdsong was a great vehicle for formless improv. Subject: The first and the best! This was the first concert I have ever gone to see. It was with my late sister who used to follow them, from that day on I was hooked. This was by FAR the best show, and not just because it was my first, it just was the best. We had tickets for the second day, but on day one a miracle happened. My Brother-in-law held up part of a fenceas we were walking by. He had no intention of going in, but he felt I needed to. Everything was in slow motion. A friend and myself boogied for the fence, ( as best we could ;-) )Security was on our tail... the next thing I know we are inside..then we are dancing closer, ever closer, until we were at the stage. There were no crowds pushing, all good people, all good vibes, it was just all good. Anyone that has pictures of the event please send them to me. I have a few, but this was the last most incredible thing I was able to sheare with my sister, and it was magic. A couple of friends and myself went up for these shows...what a trip. We were stocked up with everything...I've been to shows where we limped in strugled through, hungry and ticketles, and still left happy. But this weekend we were like kings and it fit the atmosphere. As usual I brought my camera and I got some of the best pictures ever...We were...you guessed it, in the front row behind the little girl wearing a birthday hat. I got pictures of Jerry getting out of the helicopter behind stage...also one with Jerry holding up his hand as the sun sets behind him producing a flashing rainbow eminating from behind...almost makes me sad to think about it. One last moment...one of my friends had this ball with a bell inside that we had been kicking around for a while...at a quiet moment between songs we convinced him to throw it on stage...he did and it rolled right to Bobby, who shook it and laughed than gave it to Jerry who checked it out and dropped it nead his equip...my friend has never come down. The help/slip/frank chant started right as the band took to the stage for set 2. No dice until the fall 89. Great time, very cool show. You'll hear a giant impromptu roar from the crowd right as Jerry completes the jamming portion of Bird Song. A hanglider flew right over the stage at that point. Revise: In honor of the 4th of july I listened to this again and the hey pocky way is atomic. Mydland was feeling it because he totally cuts off Weir's Looks like rain tuning and goes for it. Top notch. Subject: Thanks to Oxford, Maine!!! Thank you SO much to Maine420 and all the folks of Oxford!! You made this the friendliest and most fun rustic concert trip imaginable. Wow...best Dead scene I ever saw in years of shows...so much endless partying everywhere in every direction...fabulously surreal, miles of heads and trees and fields and tents and good weather and great vibes and no cops and everyone sharing everything...the combined buzz was staggering. We partied to Sunday dawn with a keg of beer, etc, by a gorgeous river covered in mist, awoke in the woods, everyone and everything perfectly crisp and mellow, and slowly wandered to the dream gig in the middle of nowhere. For this show we stood way in the back behind the sbd, in front of the delay towers, phenomenal sound and volume...Phil was beyond description, the most thundering biscuits I ever heard from him--except for the night before! A good show, pure Sunday Dead, fun and tight, killer Pocky from Brent and Jer, Phil at his funkiest...what's not to like? So much room to dance and freak out... Dead Heaven. If I could relive one stand, this would be it. The peak Dead experience in many lives, no doubt. Thanks again to a great town and its cool people. im sure mdma helped but i had a blast at this show.met a gourgeous young filly at our campsite the nite b4,and we had a total riot the next day.bird song was wafting and some hanggliders came sailing down during it.pocky way was pure tribal stomp.seen over 200 shows this the only one i remember w/sand in my toes.also bought my first dead base up there,vol.2. Both of these Maine shows were outstanding and were my 2nd and 3rd shows, and I met the man who would become my husband at Oxford. The residents of Oxford were a bit nervous to host the Deadheads, after the Monsters of Rock fans basically trashed the town. However, they were cordial hosts, and were very impressed at the way we treated them and their town. The Hey Pocky Way just SMOKED on 7/3. Not Fade Away did start abruptly, but once they got going, everyone was singing along and kept at it long after they left the stage. I was lucky to have a friend taping both shows and I have really good audience tapes. I highly recommend both 7/2 & 7/3. 1st Set: Stormin out with a "Hell," the effects are well-used and it's an exciting if well-produced creation. "Sugaree" is not exciting, but it's nicely strung along and competently performed. "Walkin" attempts to thicken the groove and they succeed...whatever timing the drummers are on, 7/4..blah blah, it works. Funky. "Tennessee" is kept airy and loose. One day soon, "Queen" will be elegically beautiful...this is good progress. "Bird" features admirably intricate dynamic work... never commanding, but the varied layers create a lovely experience that rewards you with multiple listens. 3 1/4 stars...maybe I'm leery of all of the Dead I've recently consumed or this concert didn't gel as magnificently as the average '5 star' rating would assess. Man, I am late to the show! I wish I could have a copy of this one but at least I can listen to the stream. This was my first Dead show and it was simply amazing! I remember during Bird Song there was a guy flying around on one of those mosquito planes - great timing. All around great atmosphere and stellar sound. This show started it all for me - and what a wonderful, long strange trip it's been! Great venue. One of my top five favorite in fact. Oxford was purely cool. I remember crying during I will take you home. Awesome sound there, awesome sound here. Thanks to whoever put this up. You are da' man. WOW WHAT A WEEKEND! 5 stars....and yes LITTLE FEAT DID OPEN. The town that left the good vibe is my hometown of OXFORD. Town population 15,000. 150,000 showed up. GOD BLESS THE GRATEFUL DEAD! These 2 shows were a ball. In a town that seemed to embrace the visiting crowd. A real nice vibe. It's strange, so many here had the same collective experience. This was one of the nicer and unfortunately one of the last shows(for me)where it was still about just getting there and getting in and enjoying. great sounding soundboard, all instruments accounted for. does NOT have that sterile canned sound some sbd's have. i remember the hanglider too think of that moment everytime i hear that song didnt little feet open for them? The sound here is great, even a little better than the night before (which is how I remembered it back then). Very nice, clean board. 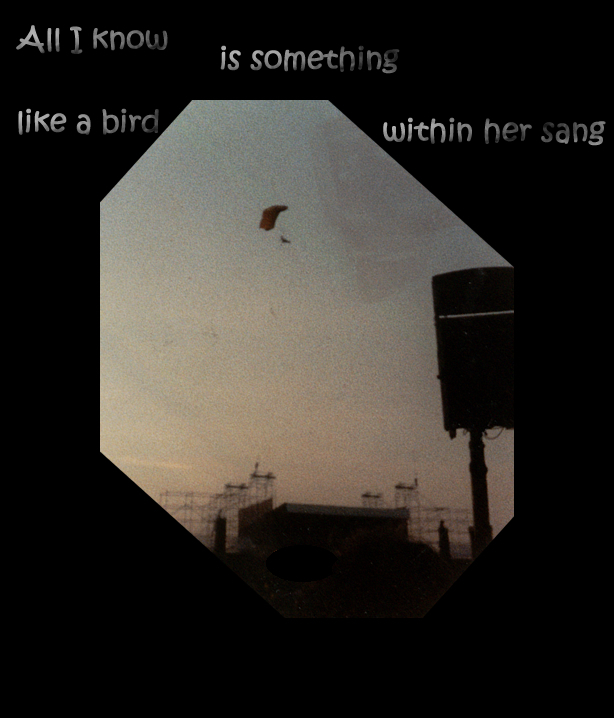 The guy circling in the ultralight during Birdsong is one of my great memories from shows that year. And the pre-drums second set is killer, particularly the Pocky Way, to which others here have alluded. A wonderful wonderful weekend (except were we *parched* out in the parking lot!). Very clean sound on this (Phil is very sharp and clean on this). Really good show, though I prefer the 1st night more. The 1st set is a bit short (by '88 standards ... 6 songs seemed to become more of the norm by the mid-90's), but a great Birdsong to close out the set. There's a funny LL Rain tease in the 2nd set, before they bail out and do Hey Pocky instead. The show has an unusual close to it ... Fantasy/Jude ends with some very funny vocal stuff. And then for the NFA encore they start with just vocals out of nowhere, before the music kicks in. A bit different. Talk about a moment in history. Just graduated UMASS in May, traveling with all my bretheren, winding up (and then back down) at Oxford Plains Speedway, and listening to the boys play as if it was their last 2 shows ever!!! The recording is just a tiny piece of what went on that weekend in July, but thank heavens it is preserved here. That Hey Pockey Way puts me right back in the middle of the racetrack, with nothin left to do but smile, smile, smile..
> about 30 secs later I got an intrusion alert from my Norton Internet Security--I rarely see a remote IP intrusion attempt (mainly b/c my dl habits are pretty rudimentary, this site and maybe one or two others--I don't even p2p). So just be careful. This show should not go unnoticed. The sound is excellent A+. The playing is inspired and full of energy especially Brent. Solid Touch of Grey which was historically inconsistent. Great Hey Pocky Way really showcasing Brent. Well worth the download you will not be dissappointed. This was a great first show for me, I had no idea what i was in for, The town was great,the bus came by, I got on, and this is when it all began!!! I just remember the guy flying over the crowd on a powered handglider during Bird Song and band almost stopping in amazement. One of the best show experiences ive ever had!Little feat got the band in a really good space! How about Bobby's pink guitar? Subject: One of my Favorites!!! The good quality brings back great memories of the our Maine road trip and camping-out with the heads in the middle no-where! This is a good Phil show too! Summer tour 88. I call it, "Nothing but Footprints Tour". Every Head was on their best behavior. The band was stressing over how to keep the scene going with the ever growing popularity. Oxford was trashed by the events the week before because of the Monsters of Rock fans. The town was scared of the Grateful Dead coming to town. The word got around and we left nothing but footprints. Maine papers reported that it was a most enjoyable weekend for all people especially the towns people. Oxford was truly the perfect weekend. i know these shows were probably great live, but the hissing during the 2nd minute of sugaree scares me...then it stops...hmmmmm the rest of the show seems real nice though--always impressed with the bass levels , here especially nice------still a 5 jerry sounds good on the vocals------weary man!! These shows were some great times,this was one of those places where we made our own universe without it being soiled with negative vibes from the local authorities.....Remember this one tourhead walking around Sunday morning,which would be the morning of this show,with a soda can cardboard flat of quarters of the Kind with no disguise,how great is that ?? "Gone Are The Days.........."
these gigs were my first and i came from scotland to see them..too many memories to mention but what is vivid after all this time is how many wonderful people i met.I remember the plane too..and does anyone remember the guy climbing up the huge fence with the crowd urging him on?..great gig,great time,great expierence. I seem to be the only one of my group who remembers that so thanks for the confirmation. You never know when you have been caught dreaming. Those shows were amazing but the scene was beyond. Too bad we cant bottle up all these good times and release them with every tape. These two shows were awesome!!! Great place and the on site camping scene was really cool. It was notable that an ultra-light plane was flying over the crowd rather low during Bird Song!!! The crowd loved it, but I am sure that it un-nerved the Dead and management. These tapes sound great...crystal clear with great bass extension...Sound better than my FOB tapes with the Neuman U89's...the bass was a little unruly for play back on even the most high end stereo's.